With the tough economic times we have faced over the past few years many families have been forced into situations they never envisioned, like grown children moving back in with their now aging parents, or in some cases, the other way around. There also seems to be certain times when art is in perfect alignment with the times. Whether a painting, a written work, a song or a film it seems to be exactly in synch with a point in time. Such is the case with the film I am writing about here, only the film happens to be over seventy years old. The movie is “Make Way for Tomorrow” which some folks may view as a tear jerker, however calling this film a tear jerker is reducing the significance of a work that has much more substance and depth than a standard tissue wiper. “Make Way for Tomorrow” earns its emotional pull with honestly in its storytelling and the strength of its characters. Generally, when a film attempts to tug at your emotions the filmmakers create an emotionally fake situation that rips open your tear ducts without shame or reason; Arthur Hiller’s film version of Eric Segal’s bestselling waterfall, “Love Story” is prime example. Here the film earns its sentiment honestly with the passion and love of the two elderly characters facing a crossroads in their final years that is out of their control, yet they still manage to hold on to their dignity. Orson Welles once said in an interview to Peter Bogdanovich, “only a stone could remain dry” after seeing this film. In 1937, Leo McCarey won a best director Academy Award for “The Awful Truth.” In his acceptance he stated that he believed he won this award for the wrong film. 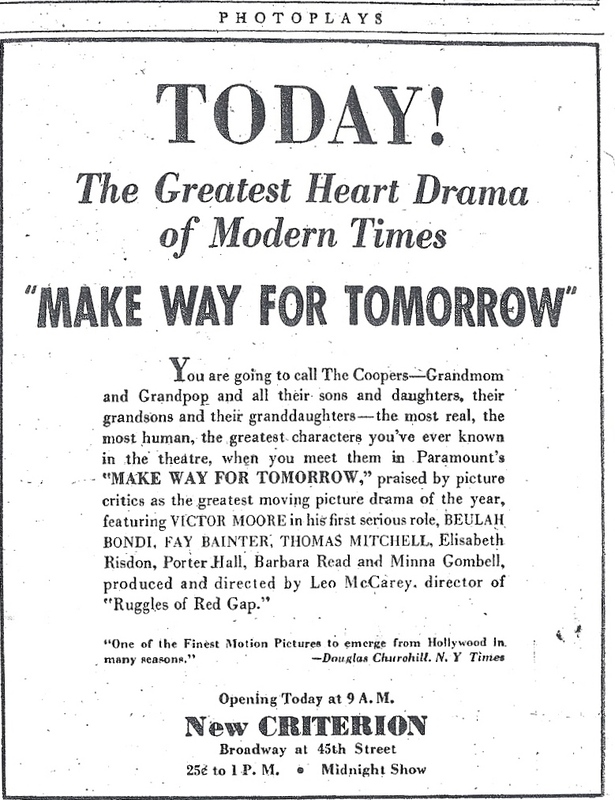 Along with “The Awful Truth,” McCarey had a second film released that year, “Make Way for Tomorrow.” Unfortunately, this film died at the box office and has received little recognition over the years until it appeared at the Telluride Film Festival a few years ago. Brought back to the attention of film lovers, and now released by Criterion on home video, “Make Way For Tomorrow” revolves around the Cooper family. 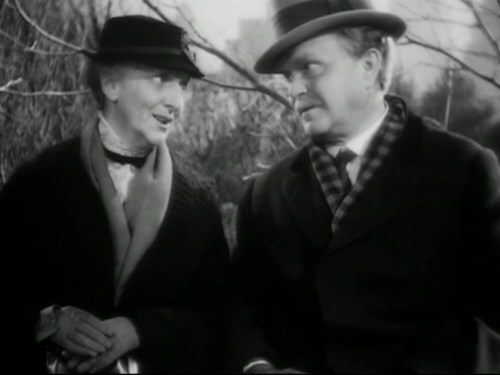 Bark (Victor Moore) and Lucy Cooper (Beulah Bondi), an elderly couple, fall behind on their mortgage payment and are about to lose their home. They inform their five children of the situation who begin to play a game of passing the buck, or in this case passing the parents. No one wants to take them in until George (Thomas Mitchell) reluctantly agrees take in their mother, while sister Cora (Eliasabeth Risdon) grudgingly takes in the father, allowing him to sleep on the couch. The parents begin to suffer one humiliating belittling experience after another at the hands of their children. In the course of time Dad gets sick and Mom is faced with a daughter who wants to send her to an old age home. Dad is eventually pawned off on a sister living in California. Before the elderly couple are forever separated by three thousand miles they are given a few last hours to spend together that they turn into an all day excursion of New York reliving their honeymoon some fifty years ago. The final goodbye at the train station is one of most emotionally heartfelt moments in American film. “Make Way for Tomorrow” deals with a topic rarely presented in film, that of elderly parents needing care, and the responsibility, or lack of, taken by their grown kids. McCarey is one of the great humanists of the cinema, an underrated master at showing the various shades of human behavior. Here he shifts moods effortlessly giving us people at their most selfish and pettiest as well as their most dignified. The family’s situation is one many can identify with and McCarey puts a mirror up in the face of the audience almost demanding to know what you would do in a similar situation, take your parents in or treat them like disposable waste and send them on their way. There are no major stars in this exquisite film but magnificent performances are plentiful. The elderly couple are superbly played by Victor Moore and Beulah Bondi; both had to be aged to fit into the roles. Thomas Mitchell, Fay Bainter and Elizabeth Risdon portray some of the grown children. Risdon is especially good as an uncaring daughter who permits her Dad to sleep on her couch. Later when he becomes ill, and a doctor is making a home visit, she forces him into a bedroom and a real bed only for the sake of appearances. 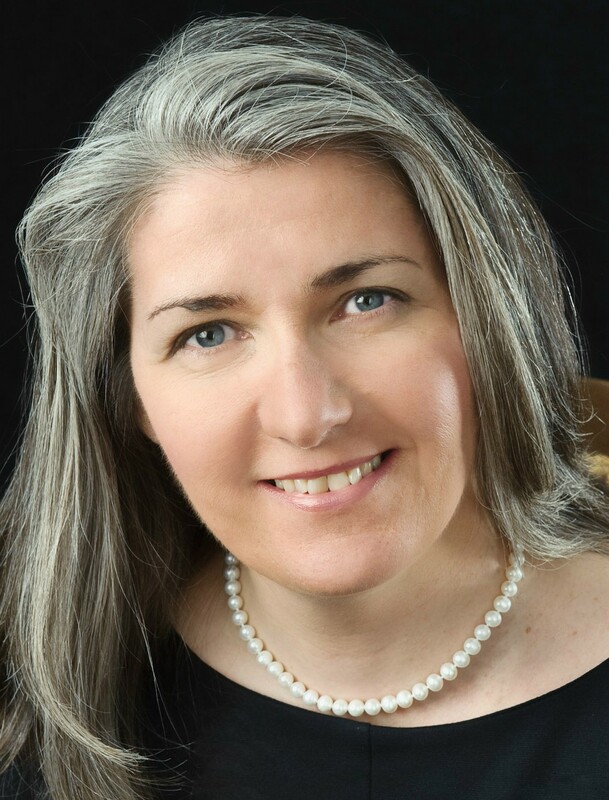 Most of the characters come across as three-dimensional to the credit of screenwriter Vina Delmar who based her screenplay on a novel by Josephine Lawrence and a play by Helen and Nolan Leary. The parents are not portrayed just as saintly victims, for example Mother Cooper is realistically nosy and annoying at times. Vina Delmar also wrote “The Awful Truth” for McCarey and was nominated for an Oscar for that film in the screenwriting category. “Make Way for Tomorrow” was one of twenty-five films just named to the National Film Registry in 2010. Each year 25 films that are considered “culturally, historically or aesthetically” significant are added to the list to be preserved for all time. These films are not chosen as representative of the “best” American films but rather as works of importance and significance to American culture. 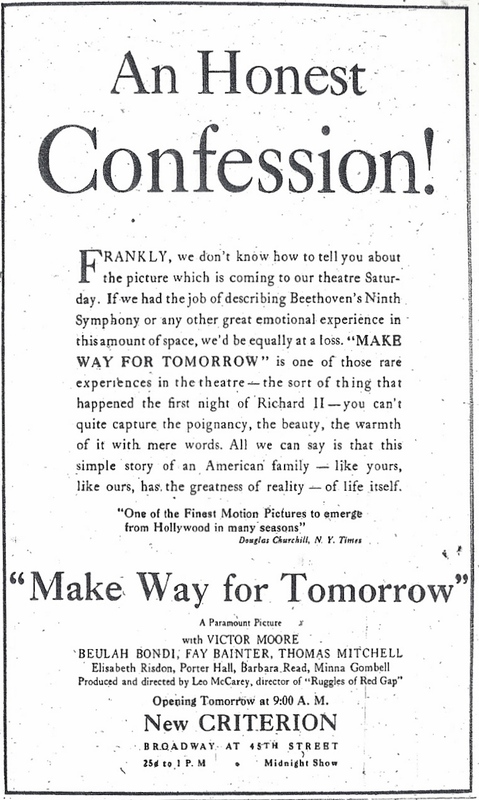 This entry was posted in 1930's, Film Reviews, Leo McCarey and tagged Beulah Bondi. 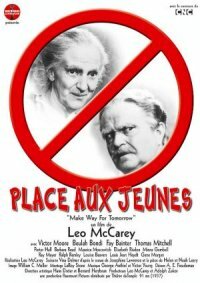 Fay Bainter, Leo McCarey, Make Way for Tomorrow, Thomas Mitchell, Victor Moore. Happy New Year John.Keep up your great work. Thanks Jay and a Happy and Healthy New Year to you. “Make Way For Tomorrow” is usually always listed in books with the theme of “the best movies that you never heard of,” and it was shown at the Museum of Modern Art just a few days ago. Criterion has done a superb job with the film. The picture looks fabulous;everything from the extras on the disc, the essay in the booklet, and even the cover artwork make this one of the best DVD releases of 2010. This is a film one would definitely want to own. Also, F.Y.I., I am excited to announce that Frank Perry’s “Last Summer,” another little known gem, and a film that you and I have championed will be making its TCM debut on Feb 1 at 2:45 AM Eastern Time, so, everyone, set your DVR’s. I feel particularly gratified about this because I put a videotape of this film in Robert Osborne’s hand some time ago and the man, as promised, has come through. Like “Make Way For Tomorrow,” “Last Summer” can now be discovered, as it should, by a new generation. Bravo, TCM, and Happy New Year to all. I glad you like this film. I actually watched it on TCM though since seeing it I have been thinking about picking up the DVD. Such a great film, one that diffinitely deserves more attention. Thanks for the update on LAST SUMMER! That is great news. Please note that the way TCM does its scheduling the 2:45 AM showing for “Last Summer” is actually the early morning of Feb.2. Happy Ground Hog’s Day!! Well, I have to admit (oh the shame!) I have not seen THE AWFUL TRUTH, though it is on my watch list.I do have to rectify that. And yes, here wishing TCM puts the film into some kind of rotation. Happy New Year! I also saw this film recently – I thought the first two thirds or so of the film are very powerful, with a standout scene being the one where the shopkeeper visits the father and the daughter takes offence at him bringing a gift of soup. But my feeling is that it becomes rather sentimental towards the end, with the whole section where the old couple are reunited for their last day together not ringing true to me. I should probably watch it for a second time, though, and see if I react differently. the film is sentimental but I think it earns its sentimentality honestly. The scene with the soup is priceless and I love the family dynamics throughout the film, good and bad. Happy New Year to you and yours. Oops, I pressed “post comment” too quickly there – meant to mention that the film is being shown on the big screen at the BFI in London at the moment! A happy new year of blogging to you, John. This is one of the greatest of American films, and in the last several years it has come to be appreciated much more with the Criterion DVD and a flurry of attention from many quarters. It has often been rightfully compared with Ozu’s masterpiece TOKYO STORY, in his wrenching treatment of old age, but at the time of its release (as you note) the film floundered. Yes, I quite agree that McCarey is one of the great humanists of the cinema, and that the performances across the board are extraordinary. A bonafide tear-jerker, but in the very best sense. Happy New Year to you and your wife John! Have not seen TOKYO STORY but I know you have spoken very highly of it. I have seen it on the shelf of my local library and will have to take a look. Thanks and a Happy New Year to you and your family. There is a wonderful moment from the 1937 Academy Awards Ceremony; preserved on film and found in the twentieth minute of the “Frank Capra Jr. Remembers,” accompanying special feature for the dvd, “You Can’t Take It With You,” where Capra Sr. presents the Oscar to McCarey, shakes his hand, and then reaching back, grabs the statuette by the torso and with a good-natured, smiling expression, attempts to tug-of-war it away from Mr. McCarey. What Mr. Capra seems to jokingly be trying to say is that he thinks he should have won the award for his film, “Lost Horizon.” The ten-second clip ends before we see who wins the match, but we know that it is indeed McCarey, as we’re certain Mr. Capra would surrender it gracefully. And besides, Mr. McCarey has a hold of Oscar by the base. Just too bad his speech is not included. Wonder if there’s footage of it somewhere. McCarey’s drama gave his two lead players more armfuls of the sweetest embraces, both physical and literary, than any actor/actress teaming in my long term memory. Victor Moore was splendid as the funny and warm old gentleman who had failed to prepare for his retirement, but it was always Beulah Bondi: surely the most versatile character actress on all levels the movies have known, that tugged at my heart during any number of her very stirring scenes. Her darling Lucy Cooper could be both a warm granny and a meddling, cantankerous old girl; but her performance of this 70-something woman was so real, it was staggering in its depth. All the more so when you realize that she was only in her mid-40’s at the time. It wasn’t the fine make-up job that made Ma Cooper so real, it was Miss Bondi’s superb crafting of this marvelous character. After waiting for decades for this picture to be released on VHS, how wonderful that Criterion has granted MWFT its deserved restoration. Though it may not be as grand as other masterpieces such as Gone With The Wind, Citizen Kane or Casablanca, it inhabits my heart more dearly than those or most other film ever will. And for that, I/we have Mr. Leo McCarey and our beloved Miss Beulah Bondi to thank. Thanks for your heartfelt and detailed comments. This statement is right on the money, Heartfelt and warm loving performances that make you feel deeply for these two people. The ending scene at the train station is perfect. A film that deserves more recognition than it has had. Thanks again!!! John, I followed your link and found your nice article. You and I seem to be on the same page when it comes to seeing this film as overlooked–perhaps because of the topic. Fine review. Kim, – I am sure you are right about the subject being at least part of the reason for this film being overlooked for so many years. It’s a heartbreaking film. Thanks! It’s funny, but I’m not sure I would have understood this movie as well when I was very young. I know I would have been moved, but at least for me, youth doesn’t expect such things could ever happen to them or their parents. Now that I’m older, I’ve seen that life can indeed be very melodramatic in situations such as this one. It’s kind of scary, actually. I think I’ll send a copy of this movie to both my sons! 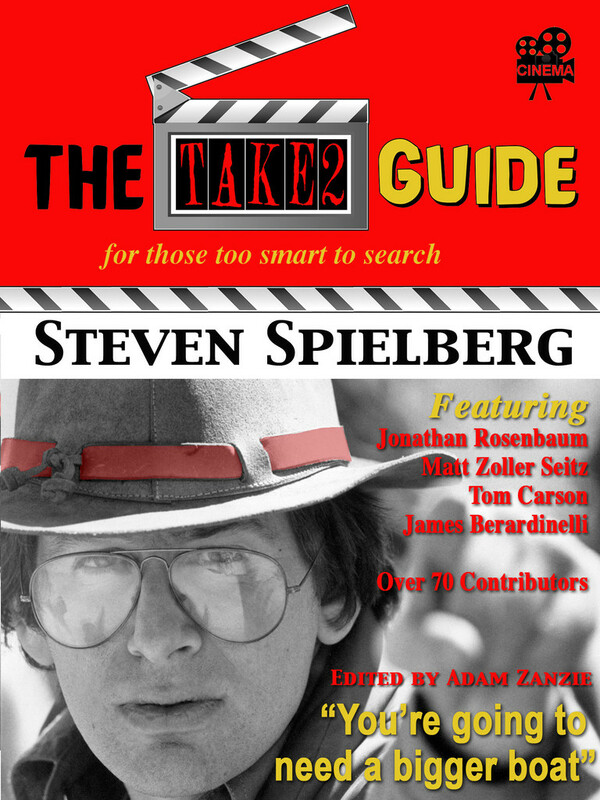 Excellent write-up and assessment of a wonderful film, John! Thanks Becky! I agree, I am not sure I would either have appreciated this film when I was younger. It’s beautifully told and wonderfully acted. A totally different kind of film for McCarey and one that earns it tears through realism and depth of character not from “schmaltz” as your mention.